Vastspace Review 2019: Is Vastspace a Good Hosting? Our prices are affordable. Servers are hosted in Tier 3 datacentre in Singapore. Up-to-date fast dedicated servers. 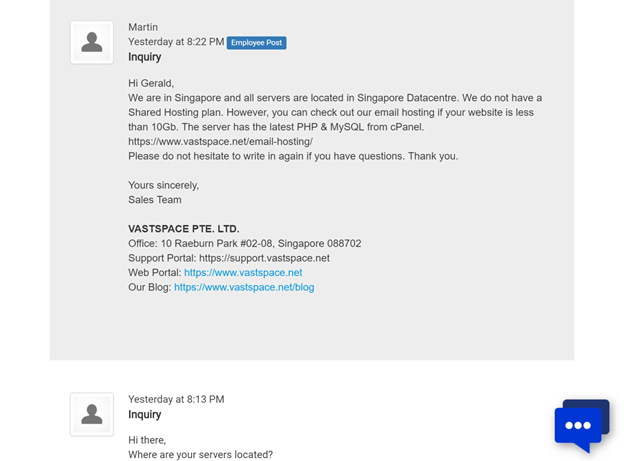 Vastspace is a web hosting company based in Singapore. It’s one of the up-and-coming providers in the market. Since its inception in 2014, it has specialized in integrated web hosting and SEO solutions. Vastspace’s website and services are offered in English. Vastspace started out featuring mainly VPS and dedicated server hosting solutions. Only recently has it started offering shared hosting packages. Despite being a relatively new offering, however, these shared hosting packages are fairly robust in the features offered. One value-added feature of note is the bonus backlinks you’ll get with any of Vastspace’s shared hosting packages. The Standard, Professional, and Business plans all come with 80 backlinks each, while custom-made packages include 800 backlinks. These backlinks come from websites with good domain authority (DA) and therefore help boost your search engine rankings. The caveat here is that very little information is given as to whether the content of those high-DA websites are actually relevant to customers’ websites, so you may get rather low-quality backlinks. You also get a decent level of security with Vastspace, since shared hosting services come with malware and anti-spam protection as standard. 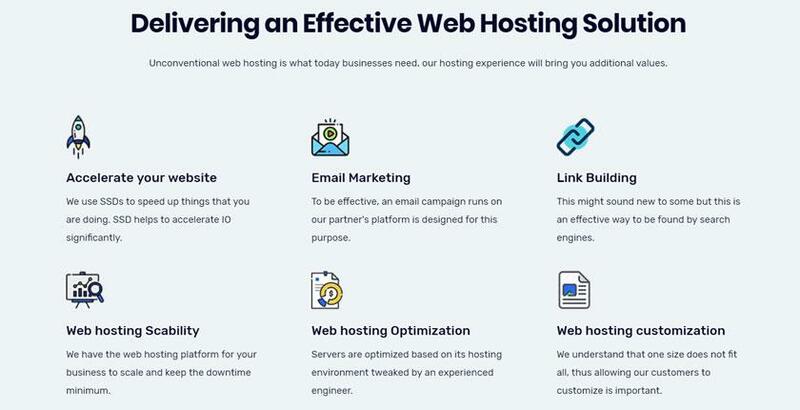 Since the email servers are kept separate from the shared hosting servers and assigned their own dedicated IP addresses, this ensures that even if another spammy website is hosted on the same server as you, your website’s reputation won’t be affected. The downside is that Vastspace isn’t the most beginner-friendly service. You won’t find any website builders or one-click installers here, so if ease of use is important to you, you may have to look elsewhere. Vastspace’s shared hosting packages are rather expensive, especially considering that they don’t include beginner-friendly tools. That said, they do give you SSD storage and lots of email storage, so if space is the biggest concern for you, this may be a good fit. Also, it seems that the main selling point of these packages are the bonus backlinks: however, as previously mentioned, very little information is given about the content relevance or quality of the websites that’ll be linking to your website, so it may not be as effective as you’d hope. There are no money-back guarantees with Vastspace’s plans. There was also a problem with Vastspace’s checkout process at the time of writing: there was no way to purchase any of the company’s listed plans. Because of this, I’m skeptical about how reliable this company is. Vastspace has a decent-sized knowledge base with answers to some of the most common questions, but this will only go far in resolving most issues. Other than that, though, you can contact the company via WhatsApp, telephone, email, and tickets. When I contacted the company regarding its services, I got a reply in just a couple of minutes — which bodes well for the standards of service here. Vastspace is an up-and-coming web hosting provider that specializes in SEO and web hosting solutions. I’d urge caution before moving ahead with this company, however, as there are issues with its website and a lack of beginner-friendly features. Wondering how Vastspace stacks up against other Web Hosting companies? Enter any other Web Hosting company and we will give you a side-by-side comparison.